Elieser (eh-LEE-eh-ser) Alexis Hernandez.Elieser (eh-LEE-eh-ser) Alexis Hernandez. Despite two stints on the disabled list, made 32 appearances (six starts) for Miami and went 2-7 with a 5.21 ERA (65.2 ip/38 er)...Opened season on 10-day disabled list due to a tooth infection suffered during Spring Training; made one rehab start before returning from rehab assignment due to broken fingernail on April 9...Returned from rehab and reinstated from 10-day DL on May 10...Overall, made four rehab starts, combining to go 0-1 with 4.80 ERA (15.0/8)...Made MLB debut on May 10 vs. Atlanta, tossing 2.0 scoreless innings in relief...Set career high with 5.0 innings pitched in a start on May 16 vs. Dodgers; tied mark for fourth and final time on June 14 vs. San Francisco, his longest relief outing...On June 26 vs. Arizona, recorded a career-high eight strikeouts...Earned first career win on July 11 vs. Milwaukee... Placed on 10-day DL on August 24 with right third finger blister; returned from rehab and reinstated from DL on Sept. 4...Did not allow a run in 12 of his last 17 appearances...Went 2-2 with 2.92 ERA (24.2/8) over that span, with 19 hits and nine walks (one intentional) to 22 strikeouts ...Had 2-5, 3.14 (43.0/15) marks in 21 games (four starts) at home, while going 0-2, 9.13 (22.2/23) in 11 games (two starts) on the road...In 26 relief appearances, was 2-2 with 5.31 ERA (40.2/24); in six starts, went 0-5 with 5.04 ERA (25.0/14)...Pitched 2.0-or-more innings in 10 of his 26 relief appearances. Posted 4-5 record and 3.98 ERA (63.1 ip/28 er) over 15 appearances (11 starts) with Single-A Buies Creek in Astros organization. Missed two months due to a back injury suffered midseason...Made seven appearances, five starts, before landing on seven-day disabled list with a right back strain on May 19. In that time, went 2-3 with a 5.46 ERA (29.1/18)...Made first appearance on April 6 vs. Winston-Salem, a 2.1-inning relief outing in which he earned win. Allowed three runs on four hits and two walks while striking out three...Made five consecutive starts from April 11-May 5, going 1-3 with 5.09 ERA (23.0/13)...On April 23 at Carolina, took loss despite giving up just two runs on four hits. Walked one and struck out season-high nine over 5.0 frames...In last appearance before landing on DL, tossed 4.1 relief innings on May 10 vs. Salem. Surrendered two runs and three hits while walking one and tying a season high with nine strikeouts...In three rehab appearances (two starts) with GCL Astros, went 1-0 with 1.80 ERA (10.0/2). Allowed just six hits and one walk while striking out 14...Reinstated from DL on July 22 and made start that night vs. Carolina. Picked up third win of season after allowing just one run on one hit with no walks and five strikeouts over 5.0 innings...Tossed season-high 6.0 innings on August 22 vs. Lynchburg. Took loss after giving up five runs and six hits. Tied season high with nine strikeouts and didn't walk a batter... Following reinstatement, went 2-2 with 2.67 ERA (33.2/10) in eight appearances (six starts) ...In 11 total starts, owned 2-5 record and 4.17 ERA (49.2/23). In four relief appearances, went 2-0 with 3.29 ERA (13.2/5)...Made five starts with Aguilas del Zulia in Venezuelan Winter League, posting 2-1 record with 2.11 ERA (21.1/5). Allowed just 12 hits and six walks with 22 strikeouts. 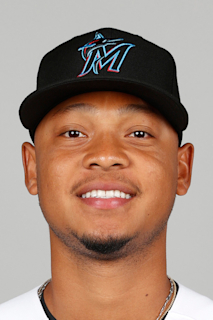 March 8, 2019 Miami Marlins optioned RHP Elieser Hernandez to New Orleans Baby Cakes. November 13, 2018 RHP Elieser Hernandez assigned to Aguilas del Zulia. September 4, 2018 Miami Marlins activated RHP Elieser Hernandez from the 10-day injured list. September 2, 2018 Miami Marlins sent RHP Elieser Hernandez on a rehab assignment to New Orleans Baby Cakes. August 24, 2018 Miami Marlins placed RHP Elieser Hernandez on the 10-day disabled list. Right third finger blister. May 10, 2018 Miami Marlins activated RHP Elieser Hernandez from the 10-day disabled list. April 29, 2018 Miami Marlins sent RHP Elieser Hernandez on a rehab assignment to Jacksonville Jumbo Shrimp. April 23, 2018 Miami Marlins sent RHP Elieser Hernandez on a rehab assignment to Jupiter Hammerheads. April 6, 2018 Miami Marlins sent RHP Elieser Hernandez on a rehab assignment to Jupiter Hammerheads. March 29, 2018 Miami Marlins placed RHP Elieser Hernandez on the 10-day disabled list retroactive to March 26, 2018. Tooth infection. December 14, 2017 Miami Marlins claimed RHP Elieser Hernandez off waivers from Buies Creek Astros. November 9, 2017 Aguilas del Zulia placed RHP Elieser Hernandez on the reserve list. October 10, 2017 RHP Elieser Hernandez assigned to Aguilas del Zulia. August 2, 2017 Buies Creek Astros activated RHP Elieser Hernandez from the 7-day disabled list. July 5, 2017 Buies Creek Astros sent RHP Elieser Hernandez on a rehab assignment to GCL Astros. May 13, 2017 Buies Creek Astros placed RHP Elieser Hernandez on the 7-day disabled list. April 16, 2017 RHP Elieser Hernandez assigned to Buies Creek Astros from Tri-City ValleyCats. April 12, 2017 RHP Elieser Hernandez assigned to Tri-City ValleyCats from Buies Creek Astros. September 10, 2016 Elieser Hernandez roster status changed by Lancaster JetHawks. September 4, 2016 Lancaster JetHawks placed RHP Elieser Hernandez on the temporarily inactive list. August 6, 2016 RHP Elieser Hernandez assigned to Lancaster JetHawks from Quad Cities River Bandits. May 26, 2016 RHP Elieser Hernandez assigned to Quad Cities River Bandits from Lancaster JetHawks. April 5, 2016 RHP Elieser Hernandez assigned to Lancaster JetHawks from Quad Cities River Bandits. July 12, 2015 RHP Elieser Hernandez assigned to Quad Cities River Bandits from Tri-City ValleyCats. June 19, 2015 RHP Elieser Hernandez assigned to Tri-City ValleyCats from Greeneville Astros. August 2, 2014 RHP Elieser Hernandez assigned to Greeneville Astros from GCL Astros. June 19, 2014 RHP Elieser Hernandez assigned to GCL Astros. June 1, 2012 RHP Elieser Hernandez assigned to DSL Astros. May 31, 2012 Houston Astros signed free agent RHP Elieser Hernandez to a minor league contract.